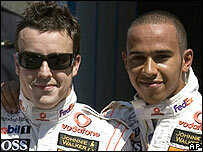 World champion Fernando Alonso believes his McLaren team are giving preference to his rookie team-mate Lewis Hamilton. The Spaniard had misgivings as soon as he joined the team at the end of 2006, he told Spain's Cadena Ser radio. He said: "From the first moment, I wasn't completely comfortable. I am in an English team, with an English team-mate, who is doing brilliantly. "We knew all the support and help would go his way. It is something I understand and I'm not complaining." What do you make of Alonso's comments about Hamilton? Alonso added that he remained confident of winning a third straight drivers' title. The 26-year-old, who won the world title with Renault in 2005 and 2006, is eight points behind Hamilton in the championship following the Englishman's maiden victory in Canada on Sunday. Alonso finished seventh in Montreal after falling foul - through no fault of his own - of a new rule forbidding drivers to pit in the initial stages of the safety car being deployed. Although Alonso has won two races to Hamilton's one, Hamilton has been more consistent and has finished on the podium in each of the first six races. But Alonso insists he has a strong chance of winning a third consecutive world title. "I've won two races out of six and I've finished on the podium four times and I have those 40 points that will allow me to fight for the title in the end," he said. "I'm calm, I'm fine, though I know there is some impatience to return to the top and dominate. "But I'm second in the championship, I'm eight points behind. It would be worse if I were at Renault, or Honda or any other team. "At the moment I am where I expected to be and with a clear chance of winning the title in Brazil [the last race of the season], and not now, in the sixth race." Asked if he felt some of the mechanics in the team celebrated Hamilton's successes more than his, Alonso said: "I have sensed it a little, but I understand it, it's an English team." Alonso's remarks come just over two weeks after he won the Monaco Grand Prix, when McLaren ordered Hamilton not to challenge him in the closing stages of the race. 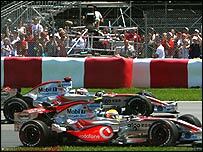 In the wake of that decision, and before his victory in Canada, Hamilton said he would not stay long at a team he felt was favouring his team-mate. Alonso has made uncharacteristic mistakes at the start of two of the last three races, but Renault driver Heikki Kovalainen, who worked with Alonso last year, does not believe he is feeling the strain of Hamilton's brilliant debut season. "He's not feeling the pressure," Kovalainen told BBC Sport. "I don't think Lewis has any impact on him. Fernando is mentally very tough and is still one of the top guys. "He pushes very hard for the win every race and mistakes can happen when you race like that. "Yes, he might have made a mistake in Barcelona and one in Canada, and because they have happened in a short period of time it looks very dramatic, but I don't think it affects him. "He is going to be very strong, fighting for the championship for sure."